P2P group has released the updated version of “SoundTaxi Professional”. 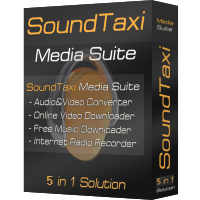 Description: SoundTaxi Professional enables you free to copy, play and enjoy your music any time, anywhere – without any DRM restrictions or copy protection. Whether you have downloaded music from Napster, TDC Play, the iTunes Store, Yahoo Music or one of the other music portals on the Internet.SoundTaxi Professional enables you to remove DRM protection and convert music (protected and unprotected) and to unprotected MP3, WMA, and MPEG4 audio files, as well as to CD, iPod, iPhone, mobile phone, Zune, Pocket PC and other electronic multimedia players.SoundTaxi Professional does not break the DRM protection in any way and the software is 100% legal to use. Technically, saves SoundTaxi Professional 100% identical copy of the DRM protected music or movie file – just in a new format and as an individual file. In this way the DRM protection intact and the license has never been broken. SoundTaxi Professional supports almost all music files with and without DRM protection such as WMA, M4P, AAC, MP4, MP3, etc. and creates unprotected WAV, MP3, MPEG4, AAC files without DRM. Converts any audio file that can be played with Media Player, Quicktime or RealPlayer. Includes an easy to use Audio CD Ripper. Stores the converted files as ordinary unprotected MP3, AAC, WAV, MPEG4 files. Copies and play converted files free for iPod, iPhone, PC, CD player, MP3 player, etc. Removes DRM protection from audio files. Removes copying restrictions and convert protected files. Converts all types of audio files (protected or not) to the format you want. Preserves ID3 tags on artist, album, title, etc. Ability to select the compression level and output format. Super fast converting speed, up to 50x speed when playing. Converts up to 16 files simultaneously. Feel free to post your SoundTaxi Professional v4.5.4 Incl. Crack – P2P torrent, subtitles, samples, free download, quality, NFO, rapidshare, depositfiles, uploaded.net, rapidgator, filefactory, netload, crack, serial, keygen, requirements or whatever-related comments here. Don't be rude (permban), use only English, don't go offtopic and read FAQ before asking a question. Owners of this website aren't responsible for content of comments.